Interview with Dr. David Eccleston, Medizen Clinic, about the most common skin conditions and how to treat them. Under the Skin is a one-to-one interview that addresses different skin issues and concerns, providing the latest information about ZO Skin Health protocols and treatments for the consumer clients. Hyperpigmentation is a change in skin colour, usually of the face, but often also of the hands and other parts of the body most exposed to solar radiation. It is a common problem, regardless of skin colour or ethnic origin. Hyperpigmentation can spread to the entire surface of the skin, either affecting different areas or restricted to individual parts. Human skin contains cells that produce melanin (melanocytes), a pigment that gives colour to the skin and helps protect the body from the sun’s ultraviolet rays. 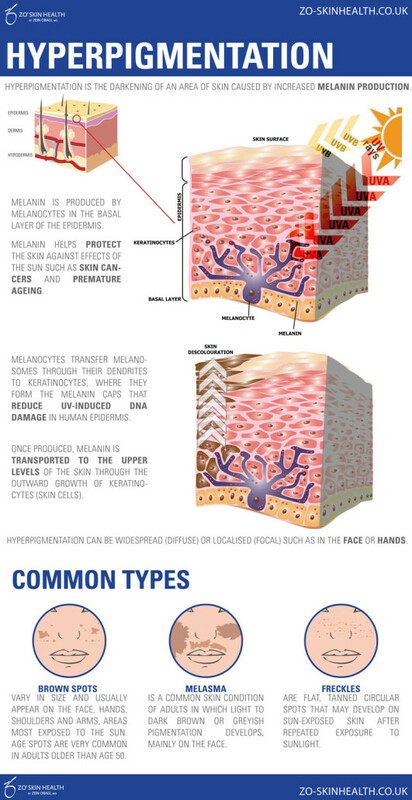 An overproduction of melanin leads to hyperpigmentation of the skin. Hyperpigmentation includes many different forms. Freckles are small circular dark spots, focused on the face, shoulders, neck, torso and hands, more commonly found on people with fair skin and red or blond hair. They are present all year round on the face of these subjects but became more evident in the summer with exposure to sunlight. Another form of freckle is solar lentigos, also known as liver spots, that are formed due to overexposure to radiation of the sun; it is more commonly called “sunspots skin”. The senile lentigo is formed by the accumulation of damage caused by sun exposure. Another form of hyperpigmentation, rather severe, is melasma, caused by an intense and uneven accumulation of melanin. If the freckles are just small spots, melasma is a spot much more extensive and unsightly. Finally there is the post-inflammatory hyperpigmentation that is formed in the presence of scars, burns, eczema and acne. ZO Skin Health and Medical products and protocols are optimised to treat a wide range of skin disorders and chronic conditions including all forms of hyperpigmentation. 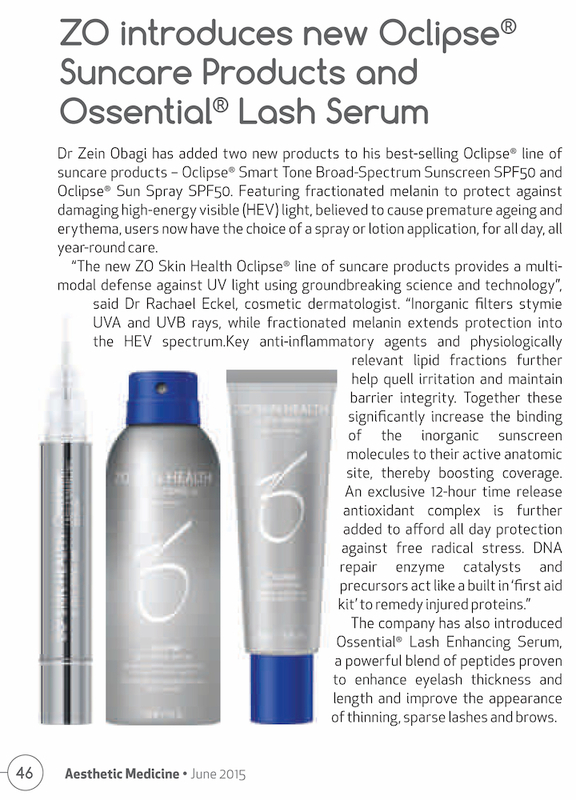 Dr Zein Obagi has added two new products to his best-selling Oclipse® line of suncare products – Oclipse® Smart Tone Broad-Spectrum Sunscreen SPF50 and Oclipse® Sun Spray SPF50. Featuring fractionated melanin to protect against damaging high-energy visible (HEV) light, believed to cause premature ageing and erythema, users now have the choice of a spray or lotion application, for all day, all year-round care. “The new ZO Skin Health Oclipse® line of suncare products provides a multimodal defense against UV light using groundbreaking science and technology”, said Dr Rachael Eckel, cosmetic dermatologist. “Inorganic filters stymie UVA and UVB rays, while fractionated melanin extends protection into the HEV spectrum.Key anti-inflammatory agents and physiologically relevant lipid fractions further help quell irritation and maintain barrier integrity. Together these significantly increase the binding of the inorganic sunscreen molecules to their active anatomic site, thereby boosting coverage. The company has also introduced Ossential® Lash Enhancing Serum, a powerful blend of peptides proven to enhance eyelash thickness and length and improve the appearance of thinning, sparse lashes and brows. New ZO Skin Health Hydrating Crème – Just The Thing For Dry Skin!